Once again, for the first time since independence, India is heading forward towards another tryst with destiny. Implementing GST will bring about a lot of changes in its wake. With indirect tax contributing a staggering 34% of the total tax (direct+indirect) collected, it will change the face of India’s tax system. GST will transform the multiple value supply chain model and system prevalent now and forever change the way India does business. Though you may witness the impact of most of these changes only gradually, the one change you will face immediately is the change in your Tax Identification number (TIN number). Going forward, whether it is the state level VAT or the Service Tax or the Excise duty, all these will get merged into one single platform, under a unique Goods and Services Identification Number (GSTIN). Who should apply for GSTIN? If your turnover in a financial year exceeds Rs.20 lakhs (Rs.10 lakhs for the seven sisters states of northeastern India plus Sikkim, Himachal Pradesh, and Uttarakhand). This clause does not apply to goods and services exempt from GST. If you are registered under an earlier law. If your business involves interstate supply. If you are an agent of a supplier. If you are paying tax under the reverse charge mechanism. If you are an aggregator or e-commerce operator. If you supply using an e-commerce platform. An assessee with a valid PAN associated with their existing registration will be issued a provisional login ID and a temporary password by Central Board of Excise and Customs and/or by departments of state Commercial Tax. Nearly 8 million taxpayers are expected to migrate from various platforms into GST. Step 1. 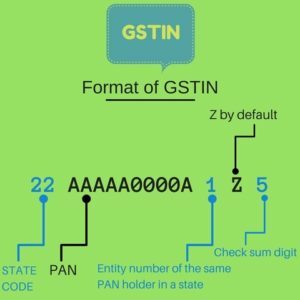 PAN ID is a mandatory requirement for GST registration except for non-resident person. Apply for one if not already done. Fill in Part-A of GST REG-01 by providing your PAN, mobile number, and email ID. The PAN is verified and validated via the common database portal of the Central Board of Direct Taxes. Mobile number is validated through a one-time password (OTP) sent to the mobile number provided and email ID through another OTP sent to the given email address. An application Reference Number (ARN) is generated and forwarded to the given mobile number and email ID on successful validation of PAN, mobile number, and email address. Step 2. Fill in Part-B of GST REG-01 using the ARN received and submit along with the specified documents at the common GST portal directly or through a board notified facilitation centre. Receive acknowledgement using Form GST REG-02. Form GST REG-03 will be issued to you in the case of any additional information or clarification is required. Step 3. Use form GST REG-04 to respond with the information required within 7 days of receipt of GST REG-03. If the details submitted are not satisfactory the application is rejected using form GST REG-05. Within three days of the successful submission of Form GST REG-01 or GST REG-04, as the case may be, a certificate of registration will be issued in form GST REG-06 along with your login ID and temporary password. Documents required with Part-B of form GST REG-01. Photograph – Of proprietor, partners, Managing Director or whole time director and authorised signatory. Business documents – Partnership deed, registration certificate or other constitution proofs. Address proof – For own property: Any document supporting ownership like tax paid receipt, utility bills, municipal khata, etc. For rented property: copy of rent agreement along with property owner’s document like Khata, Tax paid receipt, utility bill, etc. Bank related documents –The first-page scan of passbook or bank statement. Authorisation forms – One each for each authorised signatory. Scan and upload authorisation copy or the copy of board resolution or management committee resolution, etc.